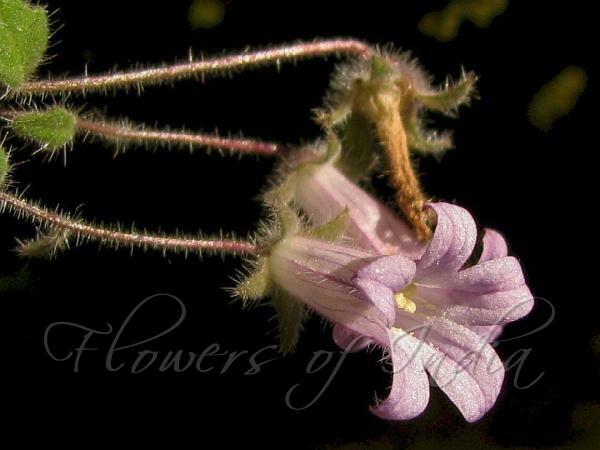 Kashmir Bellflower is an attractive perennial herb, usually found in rock crevices and cliffs. It has rather large bright blue broadly bell-shaped flowers, 2-2.5 cm long, shallowly 5-lobed. Sepals are broadly lanceshaped, 6-10 mm, hairy. Leaves are elliptic blunt, 1.5-3.5 cm, entire or sparingly toothed, rather thick, softly hairy. Stems are often tufted, usually 15-20 cm, zigzag or floppy, hairy. Capsule is 5 mm, broader than long. 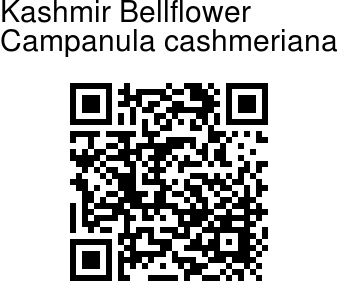 Kashmir Bellflower is found in the Himalayas, from Afganistan to Uttarakhand, at altitudes of 2100-3600 m. Flowering: August-September. Photographed near Pissu Top, Amarnath Yatra route.